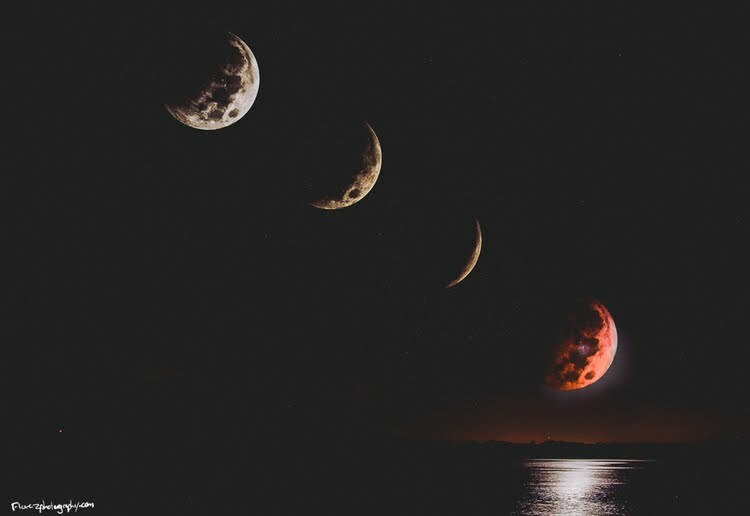 What happens when you have a Supermoon, blood moon, and Wolf Moon all happen with a Lunar eclipse, all on the same day? Why you take a photo of it rising, of course! Which also offers it's own difficulties. What many don't think about, is that the Moon is quite bright. Like, really bright. Almost as if you were to hold a white piece of paper up in broad daylight (hint hint). Also, since it's usually only visible at night (which is dark), it makes for a bit too much contrast for most cameras to capture, without a little bit of computer magic or perfect timing. The second problem, is scale. If you take a photo using a telescope, you can see all kinds of cool detail and relative to anything else, it'll be quite large. However, most of us don't have a telescope. If you use a wider lens (like your cellphone) it's possible to get a fun image with lots of foreground, but with a far smaller and less dramatic Moon. The solution to this is usually to do a double exposure, or manipulate a photo on your computer. It also leads to people doing these composites, documenting the phases. The composite photo above was taken a few years ago, so I knew that I wanted to try something else. Something possibly more dramatic, but difficult particularly due to the challenges stated above. A time lapse. Visually cool, you get a good idea of how things change, and a better sense of scale. So, as any person who likes to challenge themselves would, I went down to the beach, 2 cameras in hand. 1 focusing as a telescope, and another as a wide angle, and shot lots of photos. Afterwards, brought those to the computer and scrambled them all around. The result was pretty fun! For good measure, I even snuck part of the Lunar eclipse in at the end.